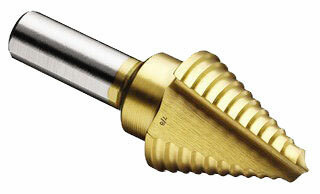 Service Warehouse TC Series Double Fluted Multi-Step Bits These bits were added to our line as a lesser cost alternative to the major label brand name bits on the market. They are constructed of industrial grade high speed molybdenum steel and heat treated to assure maximum durability. The titanium-nitride coating reduces friction extending the cutting life and prolonging the duration of peak performance.